It was a night full of love! ICYMI: Dr. Vicki Belo and Hayden Kho tied the knot on September 2, at the American Church in Paris, France. The ceremony, which was followed by the reception at the regal Palais Garnier, was filled with romance—enough to make us all daydream about fairytales and happy endings. In celebration of love, we give you our favorite celeb couples who made us even more lovestruck! A grand celebration calls for another power couple, in the name of actress Marian Rivera-Dantes and actor Dingdong Dantes. The two were made even cuter with the presence of their daughter Zia. New parents Georgina Wilson and Arthur Burnand brought along their baby Archie to the special occasion. Georgina served as one of Vicki's bridesmaids. Actor Derek Ramsay and model Joanne Villablanca were just in France in June for the World Championships of Beach Ultimate (Frisbee championship), where Derek played for the Philippine team, Boracay Dragons. Renowned actor Dennis Trillo and award-winning actress Jennylyn Mercado looked heavenly in all-white ensembles. The on-and-off couple, who last worked together in the TV series My Faithful Husband (2015), have recently been more open about their relationship—good news for the DenJen fans! Actress Lovi Poe captioned one of her Instagram posts with Filipino-French boyfriend Chris Johnson: "Just before entering the majesty and opulence of the Palais Garnier, well, you mon amour, make my dopamine levels go all silly!" Actress Rhian Ramos in a sheer white gown and boyfriend Jason Chuachuy in a sleek suit perfectly complement each other! The pair has been together for two years now. Dr. Vicki's daughter Cristalle Belo and her hotelier husband Justin Pitt just got married last year, and now they're celebrating another love story. In one of her Instagram posts during the wedding, Cristalle wrote, "When you pull me in so close to you @justinpitt that makes my heart skip a beat." How could we not include these two when we talk about couples—and class? 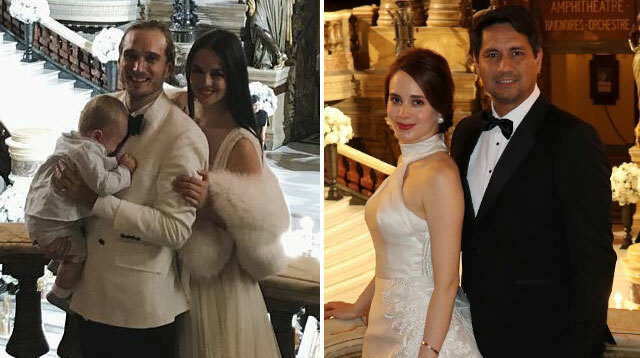 Ormoc Mayor Richard Gomez and Congresswoman Lucy Torres-Gomez, who attended the wedding with their daughter Juliana, were a sight to behold. Richard and Lucy celebrated their 19th wedding anniversary in April. Singers Ogie Alcasid and Regine Velasquez were a picture of a strong and loving relationship. Befittingly, they were also the hosts of the night's wedding reception.